Blueberries are native to North America and Canada and have been collected by native people for thousands of years and later by Europeans. Blueberries were used in a wide range of foods including drying the berries for use during the long cold winters. Blueberries are part of the Ericaceae family, includes azaleas, rhododendrons, heaths and heathers. Cultivation started seriously in the 20th century and now there is cultivation world wide. Blueberries are separated into three species - Lowbush, Highbush and Rabbiteye. The first type of blueberries is referred to as ‘Rabbiteye Blueberries’, Vaccinium ashei. These blueberries are suitable for all districts, though will not tolerate very cold conditions. They are native to the river bottoms and swampy acid soils of south-eastern USA. The plants are evergreen and highly vigorous growers capable of producing high yields of fruit. Rabbiteyes require low chill hours (less than 600hrs below 7°C) so are even suitable for the sunny north. Rabbiteye blueberries have a long flowering to ripening period compared to other types of blueberries. They require cross pollination for fruit set and this will increase the yield. They are less fussy about their soil requiring less acid soil than other blueberries, but still prefer free-draining soil with a pH around 5.5, and no lime. Rabbiteyes are reasonably drought tolerant but definitely benefit from irrigation during the development of the fruit. A very easy plant to grow with a small amount of pruning to shape, mulching with plenty of organic matter and adequate water. The plants are attractive all year round from the ‘lily of the valley’ flowers in spring to the delicious fruit and onto the autumn colours. They will start producing fruit in 2-3 seasons. 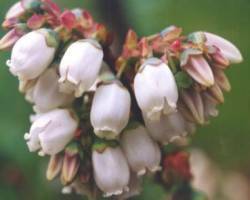 The second type is called ‘Highbush Blueberry’, Vaccinium corymbosum. Within this group are the Southern Highbush and the Northern Highbush blueberries. Native to the sunny acidic swampy areas of eastern North America. Most commonly used for commercial production. Northern Highbush requires higher chill hours than other blueberries of at least 700 hrs per year, while Southern highbush types require only about 400hrs or less. Highbush blueberries are deciduous, initially forming bronze tinged new leaves that turn dark glossy green in summer, followed by beautiful autumn hues. These blueberries are self-fertile but cross pollination will increase fruit set, size and yield. They are the earliest berries to ripen, from mid November to mid February and will crop in the 3rd to 4th season after planting. The third group is called the ‘Lowbush Blueberry’, Vaccinium angustifolium. These are native to eastern and central Canada and the north-eastern United States. These are very cold hardy requiring high chilling hours. These are low growing deciduous shrubs growing to 60cm tall. Lowbush blueberries need cross pollination to form the small sweet dark blue fruit. Blueberries are the queen of the berryfruit as they have no thorns, not invasive, no need for support or spraying. They are easy to pick and last well. Blueberries make an ideal hedge or stand alone specimen. Perfect for growing in a container. Attractive for their foliage, flowers and autumn colour. High in antioxidants and anti-inflammatory properties which is enhanced the longer the fruit is left on the bush. Reasonable levels of vitamin C, A, E & several B, they are also a good source of dietary fibre. Studies have showed this berry is also anti-aging, a cup of blueberries a day enables people to be 5-6% better at motor skills. The fruit can be eaten fresh or mixed with other fruits to make a delicious fruit salad, cooked desserts, muffins, cakes, ice-cream, sauce, yogurt, preserves and chutney. 200gm in the first year growth doubling each year until fully grown, producing up to 8-10kg of delicious fruit. Cross pollination improves yield. Plant in full sun though they will handle some afternoon shade. Blueberries are cold hardy and require chilling hours to set fruit and leaves. Chilling hours required for Rabbiteye varieties are sufficient in Auckland. 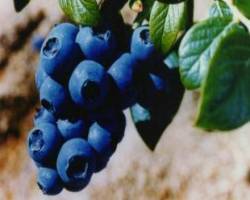 Blueberries can be grown from Kaitaia to Invercargill. Blueberries like acid soils though Rabbiteyes are not too fussy. Blueberries have a shallow fibrous root system and thrive on moist, free draining acid soils with a high proportion of organic matter. Well drained peat soils are ideal, but mineral soils such as sandy or silt loams are also suitable, provided peat moss is added during planting and on a regular basis afterwards. Heavy clay soils which crack in summer and become waterlogged in winter are generally not suitable for blueberries unless heavily amended with organic matter and sand and gypsum. A raised bed will help with drainage. Mulch blueberries with a 15-20cm mulch of bark, acid compost, or sawdust over the roots to conserve moisture, prevent weeds and over time increase the soil organic matter. Grass clippings are okay if supplemented with some fibrous organic matter such as sawdust. Blueberries are easy to grow in well prepared sites, require little care. In selecting a site it is essential that adequate water is available for irrigation during the growing season. Irrigation is vital for the full development of berries which swell rapidly in the last two weeks of ripening. A lack of water results in undersized, dark berries and a poor crop. Water is most economically applied by trickle irrigation. A trickle line on both sides of the plant may be needed to ensure uniform wetting of the root zone, but avoid over-watering. Young plants in particular are sensitive to drought stress. Remove most of the flowers in the first year to allow the plant to establish its roots and foliage to sustain it's future crops. If planting in a container attention to watering and feed is very important as there is limited area for the roots to source these. For a hedge space plants 0.6 to 1m apart. Blueberries require only light applications of nitrogen, phosphate, and potash in the first three or four years. Continual addition of compost and mulch will generally supply their needs. Slow-release complete nutrient fertilisers can be used at the beginning of the growing season. Flower buds are formed on the outer parts of the current season's growth in late summer as the stems mature. Fruit is borne on last season's wood, and vigorous wood bears the largest fruit. Minimum pruning consists of removal of dead or diseased wood, weak growth, and old twiggy branches. After 4-5 years the oldest branches may need cutting back to the crown to encourage vigorous new growth. Pruning to shape may be done at any time but if heavy pruning it is best done in winter dormancy. Blueberry plants are naturally resistant to many common pests and diseases. Phytophthora root rot is the most serious disease and can be a problem on waterlogged soils; ensure you plant in ground with good drainage. Birds can cause serious damage to fruit so netting is advised.